I started writing this a few days ago before being saddened by the recent act of mass murder, this time in Florida. John Donne wrote long ago “Any man’s death diminishes me because I am involved in mankind.” I see that of course as “any person’s”. Once again we are all diminished because an unstable person was able to obtain an assault weapon. I find comfort in our increasingly violent and also materialistic world in living things that don’t know about and are not affected by these things. Animals are top of my list, both domesticated and wild. Plants are next. So, I continue to happily engage with animals and plants and put the rest of this world in the back of my head when I can. I come out of it refreshed and a little more ready to cope. I am helped by the fact that June is really busting out all over. I have always loved musicals and even ones I haven’t seen for years leave their songs in me. This blog title is a song from Carousel which was set in Maine making it even more endearing to me. Our growing season isn’t all that long here in Massachusetts which doesn’t bother me because as much as I love to lose myself in gardening, I am ready for the change of season to fall when it comes. By the same token I appreciate the opportunity to grow things when spring arrives. The explosions of color do feed the soul. Most of the iris were already here except for the dark purple ones that were given by an iris expert friend. Before we moved here I had only seen the house once. I told myself that I would plant a peony bush here because I had one at our other house and loved its old timey appeal. After we moved in I found there were already 10 peony bushes! I planted lupine last year because we were once lucky enough to have a house on Prince Edward Island and they were everywhere up there. This is their first year blooming. I plant annuals too. I had just put these in so they weren’t acclimated but I was transfixed by their shadow on the shed wall. I couldn’t resist this cute little fairy. My over active imagination likes to think she flies around when I am not looking. In fact I am sure she does. Maybe she shape changes to one of the hummingbirds at our feeder sometimes. Each year when I put a flower pot by the well I think about the first woman who lived here, Julia Ann Storey, in the 1830s. She must be shaking her head when she sees that I have the time and frivolity to use the well for decoration, not for lugging buckets and buckets of water from it each day as she likely did. I have planted some tomatoes and plan to get the rest of our vegetables from a great Farmer’s Market a mile away. There are other plants here that will feed us, some eventually. This elderberry bush that our son put in for us was 24″ tall when he planted it. Six weeks later it is 38″ tall. He and I also put in an herb spiral that will grow both in number of plants and spiral over time. My sea kale is coming along. I don’t expect to eat much of it this year, maybe a little in the fall, because like many perennials it is around for permanence, not for quick growth. The chickens aren’t left out either. Of course they would rather eat their garden than admire it. I hope what I see as cuteness isn’t torture to them! The plants in their garden must truly be hardy New Englanders because the hose doesn’t reach this far so they don’t get watered as much and it gets a lot of shade. In here go plants I transplant from other parts of the yard and ones left over from the annuals. It is never the exactly same year to year. The three chickens watch my every move when I am working in it and comment to each other. June is busting out all over with the help of gifts from the past of peonies, iris, the old well, hen house and shed with window boxes, gifts from others of plants and time like the purple iris, elderberry bush and planting of elderberry and herb spiral, maybe the magic of a little fairy and as always watered by happy sweaty labor of the gardener, me. There are even more plants with stories and I appreciate what each one brings to my life. I hope everyone who loves to garden is getting the same chance to enjoy it and that those who don’t can fully enjoy their own passions. This entry was posted in Uncategorized and tagged Buff Orpington chickens, chickens, elderberry, fairy, gardening, gardening in Massachusetts, gardening in New England, iris, June, lupine, old wells in New England, peonies on June 13, 2016 by Betsy Alspach. Recently we completed the once a year task of cleaning out the hen house. It takes a few hours and I have learned to do everything except the bedding on the prior day so the whole thing is less overwhelming. We need to be home all day since I also scrub the concrete areas that were under the most dirty bedding and that takes time to dry. We only have 3 chickens and get so many eggs from them that we don’t need more. Caring for them takes just a few minutes each day so the only real work is their spring cleaning. I come from a line of chicken farmers and even have the distinction of having an uncle in the Nebraska Poultry Hall of Fame. 🙂 I did not grow up with these people so they did not influence or teach me anything. Like spinning it just came from within. They were farmers and I am not. They probably rolled over in their graves when they saw the care these 3 get. When Lilac, Marigold and Daisy-Dandy (named by children on the street since historically we have called our pets Kitty and Bunny and are trying to reform) stop producing eggs I won’t eat them. They will live out their lives as pets. I don’t claim to have a farmer’s mindset. A farmer does not occasionally set up activities to keep chickens from getting bored. This picture was taken before they reached their current size. Like any cleaning it is tedious but there is satisfaction in the freshness that results. Another benefit of cleaning is that I get to see two dates written in concrete. 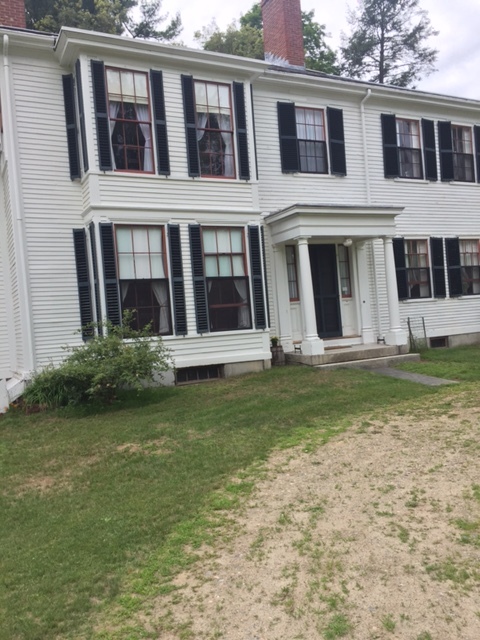 We know their home is old and that previous owners were allowed to keep it closer to the property line than is usually allowed because they said it was “historic.” The inside has wide boards which are typical of older structures but we have never researched to find its age.Being a New Englander with a proclivity for history helps me to enjoy the time I spend in there because it is a connection to the past. Our house was built in the 1830s as was the barn/garage so this hen house may also be old. I love the doors. Here are the dates. I wish the pictures were better. They aren’t old but we can see that the previous owner who was here for 60 years wrote October 1953. I put S + B 2014 when Steve added more concrete elsewhere. Since we have so many predators we can’t let them free range. I would love to see them out there on their own but they wouldn’t last long. So, Steve made what is called a “Chicken Tractor” so we can wheel them around the yard so they can forage safely. Talk about being spoiled. In this picture it is the part that is up against their outdoor run. After they started laying I gained a better understanding of the feeling that people speak of that we and the chickens are working together to provide food for us. Their manure is composted and helps our flowers and vegetables to grow but beyond that are the eggs that keep coming and coming. We give most away because we don’t need a dozen and a half a week. With their efforts we can bake at will and continually have a ready source of protein. All I know is that it feels very natural to me to be caring for them and enjoying them. For those who aren’t familiar with chickens, I can say that they are very amusing and have unique personalities. I know if I sit down with them that Lilac will jump on my knee and Daisy-Dandy will avoid being touched. I know Marigold will peck at my leg if she feels I am taking too long to get their treat out. Who wouldn’t be in a rush to eat dried mealworms and corn. They are very curious like me and carefully check out anything new in any of their enclosures. We know their many different vocalizations and what they mean just from being around them. Also like me they don’t like change or disruption. Earlier two were complaining because we have men doing work on our house that includes drilling. They got used to it. One day last winter they were putting up a ruckus so Steve looked out and saw them squawking at a deer in the yard. Other than when remarking on affronts such as those, they are very peaceful. I feel peaceful just sitting here watching them out the window and writing about them. I have no complaints about being a housekeeper for chickens. This entry was posted in Uncategorized and tagged Buff Orpington chickens, chicken coop, chicken eggs, chicken tractor, chickens, hen house, historic hen house, old doors on April 19, 2016 by Betsy Alspach. I have never understand the hoopla around a new year arriving on Jan. 1. It is just another date on the calendar to me. What does attract and motivate me are the solstices. As I have mentioned before, in the winter the snow and cold don’t bother me and I am happy to put up with them because I love New England and I don’t want to live anywhere else. But I don’t like the early darkness. I look forward to the winter solstice, the day with the least light, almost as much as a former co-worker did when she said it is better than Christmas. After that it will get lighter. I have coping strategies which help. One of our rooms gets the last light of the day and beautiful sunsets. The morning sun floods our kitchen so I work there when I can be home then. I am not the only one who uses morning sunshine for contentment. Ancient people kept track of time passing by the phases of the moon and notching wood. They knew when to celebrate the solstice and the light that was chasing away darkness. Even more ancient people must have felt they needed to stay in favor with a god so that the light would increase. I would do both if I was around then! Can’t be too sure. I wouldn’t forget to do the notching chore if it was mine in fact I would demand to be the one who made the notches so I would know it was accurate. If I wasn’t allowed to do it I would keep my own record secretly. Furtively. Stealthily. We have 2 workshops coming up to teach this month so getting ready to create new addicts- giving free stuff first really does help- also dispels darkness. The chickens are happy to stay out a little longer too. They are back to laying after the molting ended. Sometimes in winter we literally get up before the chickens and find them still perched up high and looking at us with the “what are you doing here so early?” look in their eyes. Yes, chickens have moods too. I am looking at the FEDCO catalog and dreaming about spring planting. We have an excellent farmers market a mile away that comes twice a week during the growing season so I am idly thinking about planting asparagus and a perennial kale and getting the rest there. We have no snow so I could put down newspapers covered by a tarp to kill the grass in the areas needed. But at the moment just winter day dreaming is fun. I am reading these three books I received for Christmas. Actually I told the givers to get them for me so I suppose I sort of ordered them. So, the days are slowly getting longer. I do like to feed the wild birds, light candles, and can appreciate not needing to go out and weed but instead can read or spin. I do like to settle in with these activities for awhile. Since I know the darkness won’t last. This entry was posted in Uncategorized and tagged Appalachia, books, cats, chickens, Daisy Turner, dyed wool, Edie Clark, gardening, handspinning, morning light, New England, sunset, winter solstice, wool batts to spin on January 7, 2016 by Betsy Alspach. I have been thinking about fall being a time of harvest in colder climates such as ours in New England. I do believe we see effects of climate change here because twenty years ago we would have a hard frost by the end of September and it would have stayed cold until we had a few days of warmth called an Indian summer. Our first frost now comes well into October and we no longer have an Indian summer because it doesn’t follow the pattern of getting really cold and then warming up for a few days. It stays warmer longer and just gets colder over time. We get frosts at night but the days remain warm so it isn’t the same. Today it was 63 degrees. The Harvest Moon is the name of the full moon that occurs in September. I am sure most know that this year it was a super moon which meant it was full when it was closest to the earth and so it looked really big. The lunar eclipse added to the excitement. It is called the Harvest Moon since that was, and still is despite warmth, the time when most crop harvests were brought in for the winter. I harvest some typical things but I began to wonder what more I could harvest. The chickens helped me with this little challenge. They recently began molting for the first time since they were not old enough last fall. It is a little ghastly and we still aren’t used to how they look. Next year maybe we will take it in stride. It is a natural process by which they lose their feathers in spots at a time. Which means we see areas of bare skin that do begin to fill in with new feathers but the chickens look as though they are abused and neglected rather than being cherished as all our pets are/have been. They don’t peck each other so we have never seen their skin bare. Their necks look especially ugly. They don’t seem to mind it and get enough warmth from other feathered areas as they only come off in little spots at a time. I look them over each day to be sure they are healthy so I have to look at those areas too. Quickly. I won’t take any pictures of them now! But it was molting that got me to thinking about harvest and history. Their outer feathers have the purpose of keeping rain and dirt away from the body much as a dual coated dog or sheep get with their coarser outer coat. The expression “madder than a wet hen” comes from the fact that if they get wet they are at a greater risk of developing a respiratory disease. Chickens easily succumb to respiratory diseases. So they don’t like wet. The undercoat is soft, downy and keeps them warm. As I saw these feathers around I began to think of what people did in the old days when they were used everything that came their way and wasted nothing. What could I do with feathers that have come my way? I don’t need to use the quills for a pen. As a left handed person it would just mean that I would get ink on side of my hand that was on the paper since my hand goes over the writing, not before it. So it’s good I don’t need that. But then I realized I could bind together the long outer feathers for a feather duster. So I am gathering them and gently soaking them to be sure they are clean. I don’t know how well it will work or if it would have been the soft undercoat that was used. I am not motivated to gather the undercoat this time because it seems dirtier and more work to clean. I could use them to stuff a pillow I weave. Maybe next year. 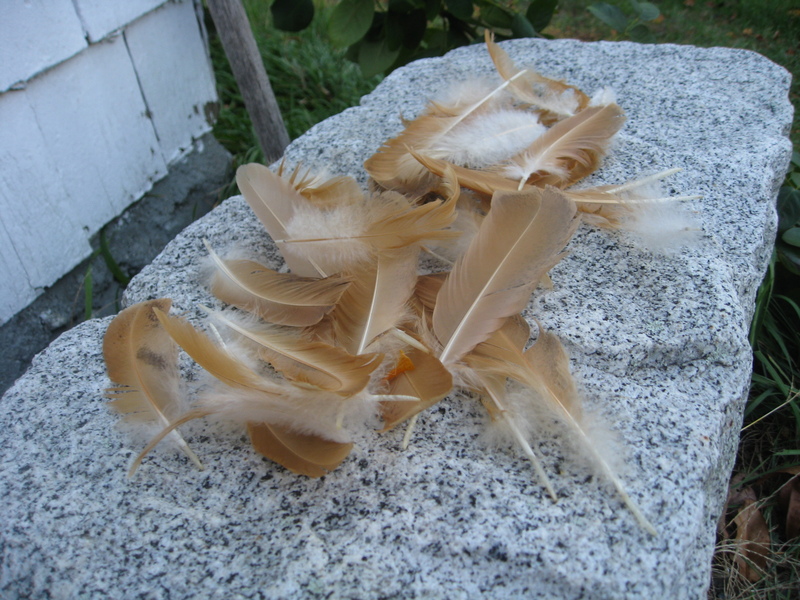 So I am harvesting the feathers for me and our kitten. She likes this new toy. She is so very fierce. I have always harvested other more typical things. I froze our tomatoes and dried our herbs. I had many green tomatoes which I brought in before the frost and let them redden up inside. 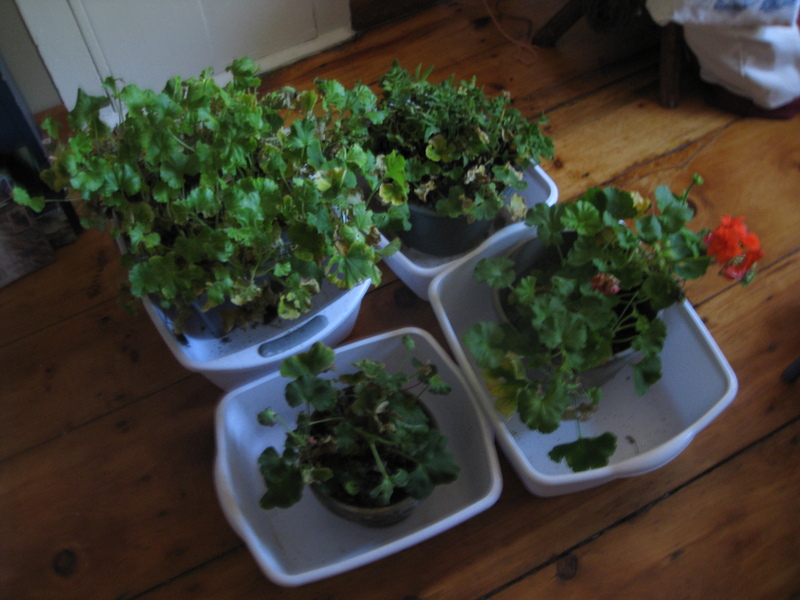 My grandmother would put her geraniums near a sunny window in their huge Victorian attic to overwinter and I have done that also. 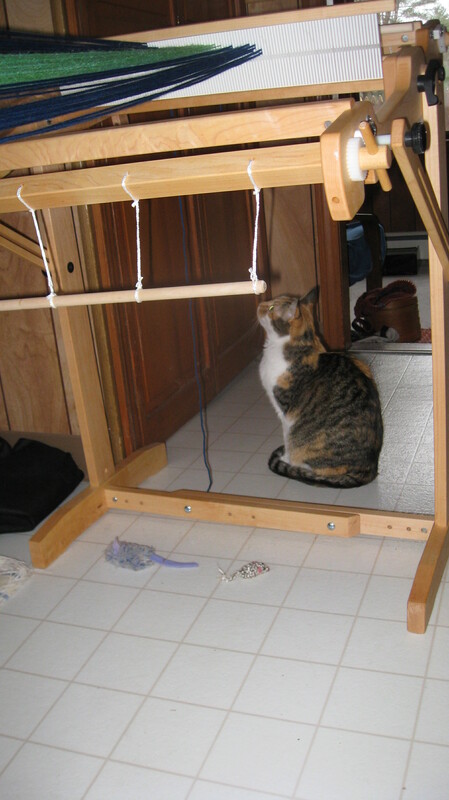 I put them in my fiber studio upstairs as my attic window is small. They get a bit leggy for lack of the full outdoor light they want but it works out.
! 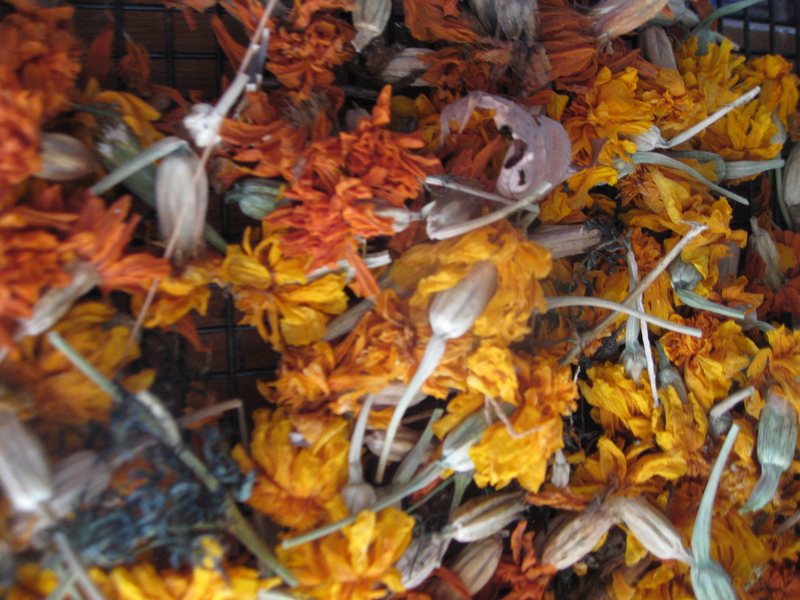 have brought in marigolds that I will eventually use for a natural dye. I add onion skins to the dye pot and a bright yellow results. The tint of it varies from pot to pot each year which also makes it interesting. I am also drying some of their seeds for next year. More on that risky possibly scary outcome next time. The continued warmth means I can continue to harvest the sun to dry my clothes. The compost heap can still be fed because it isn’t all frozen yet. Next spring the chicken’s composted manure, bedding, and all the vegetable and other scraps that they don’t eat will provide a rich nutritious compost to help my plants grow like weeds. The smaller feathers in the coop get buried in their bedding with their manure. I harness/harvest their manure during cold weather to provide a little warmth for them. Odd as it may sound to non chicken people, and it sure did to me, a neat nick, there is a method to use their manure to help them overwinter in cold climates. My first criteria for a breed was one that was winter hardy but we still make changes to help them stay warm. Deep bedding means I don’t put the manure in the compost heap now as I do in warm weather. I bury it deep into the bedding and keep the bedding layer deeper in the winter. The idea is that the manure breaks down and provides some warmth just as a compost heap is warm internally in the summer. Being buried every day or so the books told me meant it didn’t smell. I was skeptical but it really did work. They never had behavioral changes that indicated they were cold. 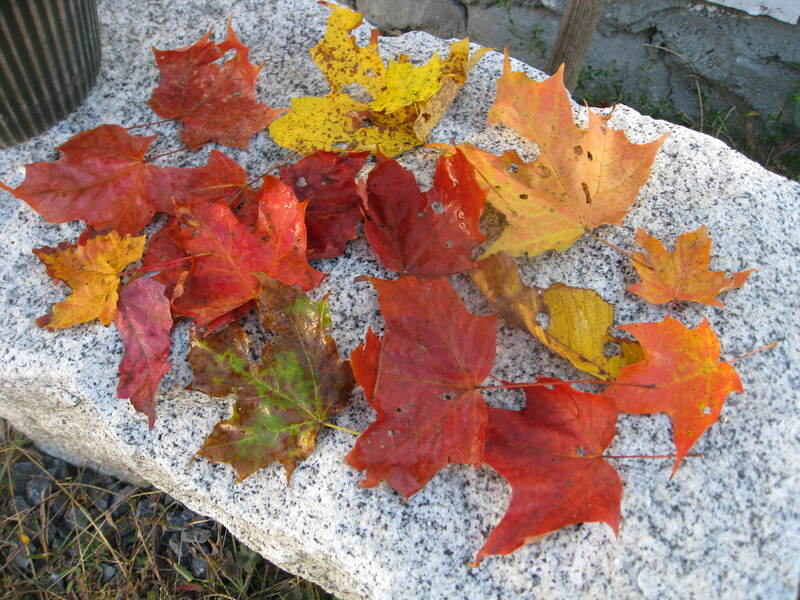 We do not lack for fallen leaves and much of them are composted. I take others to put in the back of the hen house for bedding. My husband doesn’t want them in the front area where he walks because he can’t tell what may be camouflaged that he wouldn’t want to step on. I can respect that. I have found on our one acre that there is plenty to harvest. There is a term called permaculture which suggests we should look at patterns in nature on our properties whether a farm or a tiny lot and apply those patterns to our management of our property. Following permaculture even to a small degree enables us to be more ecologically responsible because we will waste less, work with nature and be more resilient and more self sufficient. It is a holistic approach and its application varies depending on each person’s location and resources. As with any idea I pick and choose what to use. For example, a more dedicated permaculturist than I would eat those chickens when they stop laying eggs. Not me. But I think it is a fun challenge to see what parts of it fit me and then to try them. I figure every bit helps. This entry was posted in Uncategorized and tagged Buff Orpington chickens, cats, chicken feathers, chickens, climate change, composting, geraniums, harvest, keep chickens warm, marigolds, natural dyes, New England, permaculture, tomatoes on November 9, 2015 by Betsy Alspach. 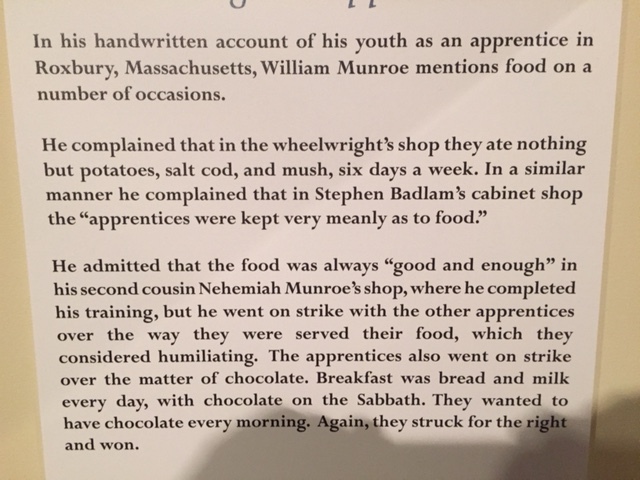 Last Saturday we went to Concord MA to celebrate Father’s Day. Steve chose the location so he could see a baseball exhibit at the Concord Museum. The museum is very attractive and provides a great deal of historic information. I will however never forget this plaque- be sure to read the very last sentences. Now that is a strike for which I would work hard! We had lunch at the Main Street Cafe which offered some refreshingly creative sandwiches and the best lemonade I have ever had. Then delicious coffee and a cupcake at Haute Coffee in an old building with lots of character. My kind of coffee place! After coffee we went to Ralph Waldo Emerson’s home. I have read a lot about the Transcendentalists as an offshoot of reading biographies of Louisa May Alcott. We visited her house also in Concord several years ago. Before going to Concord this time I looked up some of Emerson’s quotes because I was in need of some philosophical boosting up after last week’s shooting event. These horrible occurrences no longer surprise me but always sadden me. We seem to live in a world where violence against innocents is happening all the time. How do caring people responsibly keep in touch with country and world events without being taken over by the sadness of them? Unfortunately my ponderings haven’t provided me with the perfect answer to this question. Because there is no perfect answer. I would love to hear ideas others have found. The main thing that I try to do to cope is to look for various strategies for coping and realize that strategies have to be shuffled around to keep them fresh and meaningful. The quote above by Emerson is helpful to me right now. To me it speaks of inner resilience which has always been important since the beginning of time and is needed even more so today. It calls for us to be responsible for our outlooks and for our responses to world events. But just as importantly in my mind is that is contains the encouragement that we CAN figure out ways to cope. As always some of my favorite ways to get a break from outside events and gain perspective are through the teachings of the natural world, living creatures and of course…fiber. 1) Stick close to your pals. 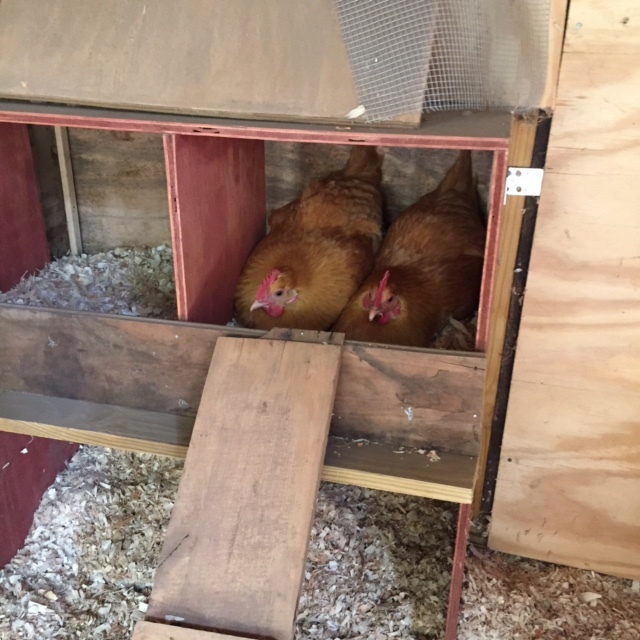 Daisy-Dandy and Marigold sharing a nesting box despite there being an empty one available. 2) Spend a lot of time thinking about your beloved creative projects and look at them from all angles. 3) Never forget that there always have been, and always will be, many more caring people in this world than there are hate filled ones. Focus your thoughts on them. Don’t forget the ones that always make you laugh! This entry was posted in Uncategorized and tagged Buff Orpington chickens, cats, chickens, Concord MA, coping with tragic events, Ralph Waldo Emerson, Sesame Street, tragic events, Transcendentalists, weaving on June 24, 2015 by Betsy Alspach.